When in doubt, expect a child to steal the show. That eternal truth was on display again Monday at the White House, as the son of former Army Staff Sgt. Clinton Romesha wandered on stage before his father’s Medal of Honor ceremony. 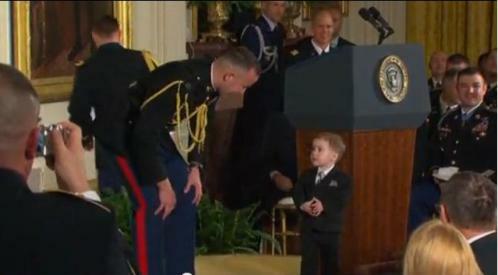 You’ve got to love the Marine captain ushering little Colin off the stage without incident. For more coverage of today’s ceremony, check out Army Times’ story.